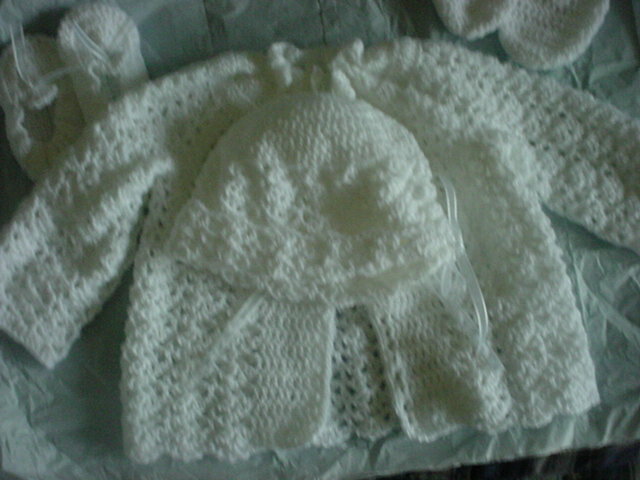 Baby Crochet Layette Set. Fits newborn to 6-7 months. A Timeless Keepsake For Generations. This is also my favorite item to make. 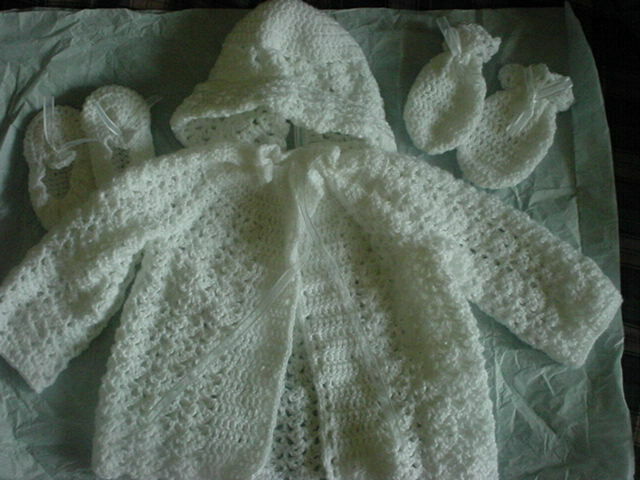 Over 25 years of experience with crocheting this particular layette set, even as gifts for random strangers. Crochet shells (shown) or hand knit layette set includes sweater, booties, bonnet, & thumbless mittens. Item shown above was finished with satin ribbon, however, a matching crochet tie is normally used for sweater, booties, bonnet and mittens. Click here to view knitted style and more bootie styles. Crochet Shell Layette is also an an accessory for the Crochet Shell Baby Blanket. Warm and soft. Made with softest quality baby yarn, but can be made with a variety of yarn types. For best results soft baby yarn, cotton, wool, worsted weight or sport weight yarns are preferred. Machine Washable/Dryable, unless special care yarn selected. Colors Available: White, Tiffany Blue, Pink, Itz A Boy Blue, Mint Green, Baby Lilac (Purple), Rainbow (multi pastel colors), Baby Yellow. Or request a special color of your choice.